At Utopian, we have a different kind of metrics to score a contribution. One of them is about commit messages. And I generally have to score low or average on that question. Why developers should write good commit messages? It will help other developers to understand what's happened inside the change set for each commit. It will help internal teams (generally project management side.) to create changelogs, announcements on new iterations. Everyone can read and understand a text, but, not everyone can read and understand the change set in the source code. 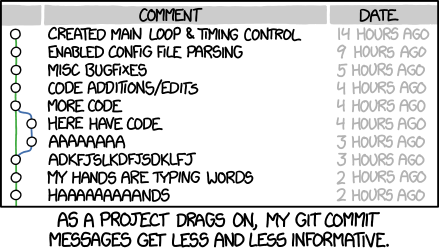 What is a good commit message, anyway? nicely even when it's indented. file/feature ...", or "Make Subsurface..."
At the end of the day, it's not very complicated. Just make sure you have a simple one-liner header, and a descriptive summary about the changes. Oh, there are so many of them. A search query with damn on commit messages at Github, results with 642,505 commits. Unbelievable, right? We don't want to bother developers with details, however, we want to see git logs clean, understandable. That's why we have a separated question about this on our review questionnaire. If you care about this, not only you will get better review scores, you will also have better git logs which will help other contributors to work on your project.